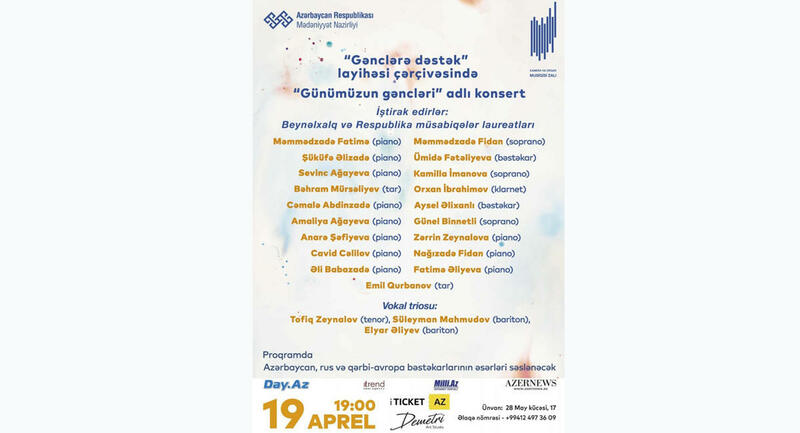 Azerbaijan State Philharmonic Hall will host a concert of young musicians on April 19. The concert will be held as part of the project "Gənclərə dəstək", Day.Az reported. The winners of international competitions pianists Fatima Mammadzade, Shukufa Alizade, Sevinj Agayeva, Jamala Abdinzade, Amalia Agayeva, Javid Jalilov, Anara Shafiyeva, Fidan Nagizade, Zerrin Zeynalova, Fatina Aliyeva, tar musicians Bahram Mursaliyev, Emil Gurbanov, sopranos Fidan Mammadzade, Kamilla Imanova, Gunel Binnatli, clarinetist Orhan Ibrahimov, composers Umida Fataliyeva, Aysel Alikhanli as well as vocal trio, consisting of tenor Tofig Zeynalov and baritones Suleyman Mahmudov and Elyar Aliyev will perform the works by Azerbaijani and foreign composers. The project has been organized by the Philharmonic Hall with the support of the Ministry of Culture in the concert season 2016-2017, which lasted a year. On May 25, 2016, the Philharmonic Hall celebrated its 80th anniversary, and this project has become a kind of dedication to this significant date. Gənclərə dəstək project aims to identify and support young talents. Also, the main goal of this project is the preservation and development of the traditions of the world and national musical culture.